One thing I find about this game..it's ok to be a big fan of the game..and when you're done with it, move on and come back when the expansion is here. I find this game much more manageable than Destiny 1. I look back at all those amazing moments playing that game...but also shudder when I think of all those 2-3 AM nights where people are just yelling at one another while banging their head against the wall in a raid. And I guess I was wrong with the Collectors being $200... 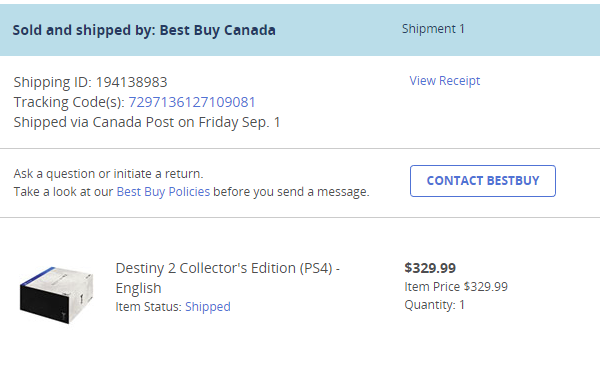 I just remember selling the first Destiny 1 collectors edition off for $400...then kind of regretting it when I realized how much I'd like the game =P. Ack! That costs more than my PS4 1TB did, a lot more. No i was at eb this morning. They had one in stock but when scanned the price was at the full original price. Weird, hate that they give different info to people, one store different from the next. Anyways consider it expired then.